Malaria hardly needs an introduction. With over 200 million people infected, it takes the life of an African child every minute. Although we have drugs to help treat the disease, there isn’t an effective vaccine available, partly due to the malaria pathogen’s variability. Now, a research collaboration between labs in the US and Australia has brought a step closer to that goal by figuring out how to produce a vaccine which works against many different strains. Vaccines are basically a way of training our body to fight a disease. By exposing our immune system to a weakened version of the pathogen (or something that looks similar), we teach it what to expect and prepare it for a real infection. It’s a bit like the way soldiers in movies train by shooting and stabbing wood or straw dummies. The mechanics are different, but the concept is the same — using harmless mock-ups to learn how to identify and fight an enemy. Our adaptive immune system makes a huge number of antibodies that can recognize invaders in the body, but there’s normally only a small amount of each one. Once an antibody has been used, though, the immune system remembers it and ramps up production to be ready for the next encounter — and that’s why vaccination works. The problem with malaria is that so far it’s proven too variable for this strategy to work. Scientists have tried to make a malaria vaccine by getting the immune system to produce antibodies against a malaria protein called AMA1. It works, but the antibodies are only effective against that particular version of AMA1. We face the same problem in making a flu vaccine, but in that case we can make a cocktail using the three most common strains of flu each year. We can’t do the same for malaria, since there are over 200 different versions of AMA1. We can’t include them all, and vaccines using just one version don’t teach the immune system to recognize the others. The researchers discovered that they could get away with using far fewer than 200 types of AMA1. Earlier work had showed that a vaccine which included several AMA1 versions could train the immune system to recognize several different strains, so the team gave rabbits a cocktail of four diverse AMA1 variants to try to figure out how and why this led to a broader immune response. 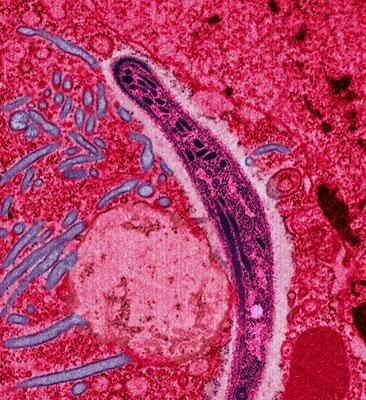 To their surprise, the antibodies produced in response to this vaccine weren’t just able to recognize the four original malaria strains, but also 22 other strains they tested. Instead of learning to identify the unique quirks of a particular version of AMA1, the immune system had figured out what the four different versions had in common and learned to respond to that. The team are hoping that this vaccine, which they’ve dubbed Quadvax, “may be sufficient to overcome global AMA1 diversity.” It’s still too early to say, of course, but it’s an encouraging advance nevertheless. The next step will be to make a formulation for humans and test it in primates and in a human blood-stage model. Of course, it’s fantastic and important that we’re making progress in developing a vaccine for malaria, a disease which devastates the tropics, and a similar approach is apparently being used to try to develop an HIV vaccine. I’m also really drawn in by the beauty of this result, though. When challenged with diversity, the immune system identifies a pattern and responds to the common, conserved elements. There’s something really elegant and powerful about that which just makes me smile in appreciation.